St Louis is one of those places I end up when I'm out with friends and we have last minute a craving for something sweet. If we're not at San Churros, then we're here. 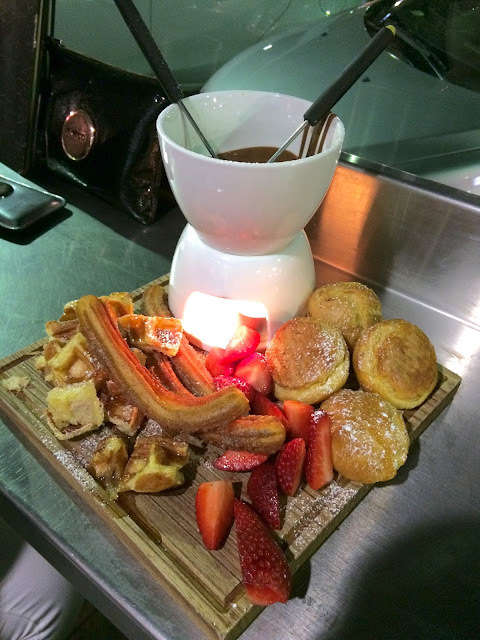 One of my favourite things to order is their fondue which is super easy to share and always satisfying. The churros are not overly crunchy which is what I prefer, the waffle pieces are drizzled with a bit of honey (I think?) and of course there is no better combination than fresh strawberries and melted chocolate. My only complaint would be the profiteroles (not filled with anything) which I found tasted too bland on its own and didn't have a very nice texture. They've been the same every time we've ordered the fondue. But really, covering them in chocolate really does help. Other than that, it's a generous serving size and really perfect for sharing. A great place to satisfy any sweet cravings but definitely be prepared to line up for a table on Friday and Saturday evenings! They also have fab ice cream - refer to one of my older posts here for more pictures. PS. The Churros martini is a nightmare. Hot caramel, melted ice cream, soggy banana pieces and churros left wallowing in the mess. Not worth even half of the price on the menu. It's probably the only one to avoid!